It seems like with every day that passes, it gets easier to handle tasks on your own. If you haven’t done something before, all it takes is a quick Google search and a 15 minute YouTube video to get the instructions on how to do just about anything. However, not every project is something you should do yourself. 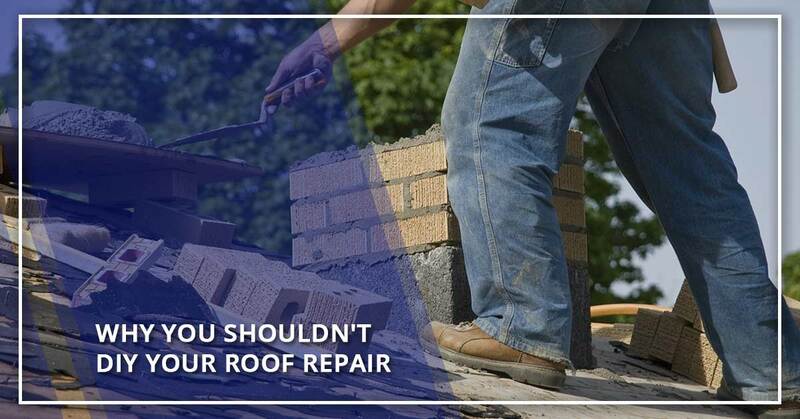 That’s why we have gathered some of the biggest reasons why you should not try to repair your roof on your own. Instead, call us at SAFG Inc to let our professional roofing team take care of it for you. With how big of an investment it is to repair or replace a roof, it’s tempting to think you’ll save more money handling it on your own. If you’re just replacing a couple of damaged or missing shingles, that’s not a problem. However, if it is a larger scale project, you’ll end up spending a great deal of money and even more time trying to complete the project alone. A professional roofing team will not only be able to diagnose damage and find an affordable option to fix it, they’ll ensure it is done safely and to code. If you do it yourself, you’re much more likely to make a mistake out of inexperience. Then you’ll have to pay for a professional to come and fix the mistake, costing you more in the long run. Most roofing material manufacturers provide long-term or lifetime warranties. However, one of the terms that is almost always present in those warranties is that it will be voided if the materials were not installed by a professional. That’s because if the materials are not installed properly, the manufacturer cannot be held responsible for any damage that occurs. Even if you take a gamble and end up with a perfectly installed roof, you are still letting go of the backup plan provided by a manufacturer warranty. When you go with a professional roofer, they ensure the job is done right, and the warranty ensures you’re protected in case damage occurs down the line. While you may think it looks easy to install a roof, it is actually incredibly dangerous to do. You’ll have to contend with heights, walking on an extremely sloped surface, weather issues, and power tools. Experienced professional roofers not only have the right tools for the job, they have trained for years to work in these types of conditions. That’s because they have replaced and repaired hundreds, if not thousands, of roofs in their time. Because of their experience, they’ll be able to get the job done safely, and far quicker than someone inexperienced could do. Additionally, your roof may be so damaged that it is unsafe for you to be on. Whereas an experienced professional will be able to catch the telltale signs of damage, you are more likely to overlook it with untrained eyes, resulting in possible injury and further damage to your home. Those trained eyes are honed to see the root of the issue that you are more likely to miss. If you try to patch your roof after noticing a water spot on your ceiling, you may only fix the aesthetic issue, completely missing the larger problem causing it. When you see water damage appear on your ceiling, there will be damage lurking underneath, waiting to cause even more damage over time. This is especially a problem when homeowners choose to shingle over an existing roof. It might make it look like it’s fixed, but the underlying issue still exists. Shingling over an existing roof will also void the warranty and results in a short-term fix with long-term financial consequences. A new roof has the power to add beauty and style to your home, improving your curb appeal. However, an improperly installed roof will end up looking cheap and shoddy. Consider how much surface area your roof covers; it’s definitely going to stand out if it wasn’t installed right. With a professional roofing team handling the job, they’ll ensure it’s done right and looks great. Otherwise, you’ll have rippling shingles and an uneven layout to contend with. When a roof doesn’t look good, it won’t protect your home well either. Even if you’re an accomplished DIYer, it’s just not worth the risks to handle extensive roof repair or replacement on your own. Instead, when you’re looking for a high-quality roof that you can count on for years to come, call SAFG Inc. Located in Fairburn, we can handle jobs for the suburban Atlanta area. Don’t risk the injury or damage that can come from improper installation. Instead, let our team of experienced professional roofers handle the job and get you a roof that will look and protect great! We hope to hear from you soon.